Discussion in 'Servos, Switches, Power Expanders, etc.' started by teookie, Dec 30, 2012. 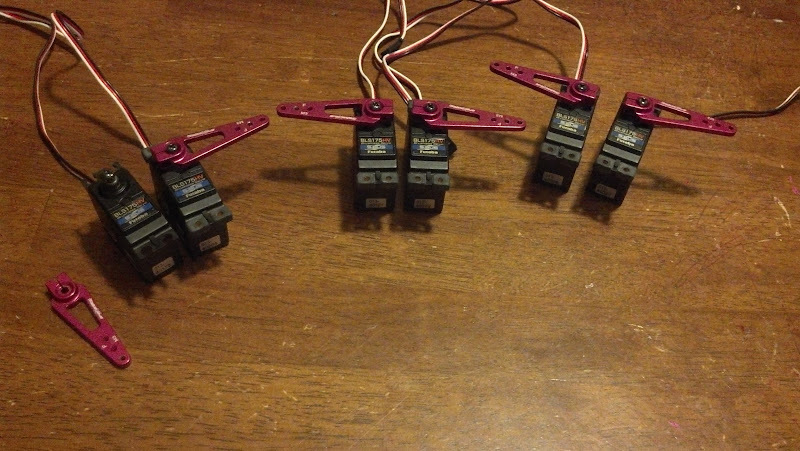 Six Futaba BLS175HV servos for sale. Practically brand new, only 4 flights on them. $90 each including the AL servo arms. Reply or PM with questions if interested. These servo's would work in anything 30cc 50cc or 100cc. I feel I should point out that getting the arms for free saves you a bundle. ;-) Surely someone out there needs these servos. Damn, I wish I saw this 2 weeks ago. Nevermind, these are not what I am looking for. Still a great deal. Apparently I am a bit dyslexic. I'm going to pass on these as they are not what I thought they were and I can't really use them. However, it is still a good deal. If you buy all six, you save about 420 bucks over buying them new! This man speaks the truth. This is basically a complete servo setup for a 50cc plane. Sure they cost more than a 7955 but that's why I'm throwing in the arms for frizzle. If I seam anxious to sell it's because I am. I really need the money! Lowered my asking price from $100 to $90 each.